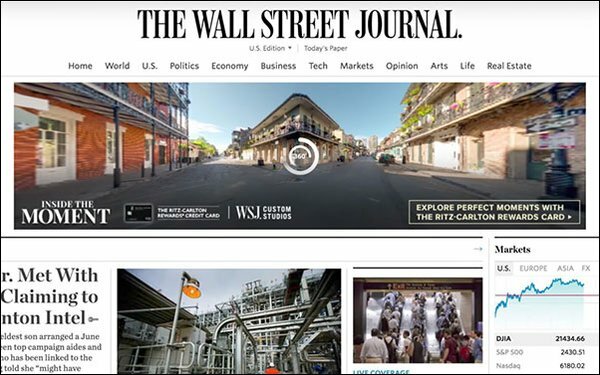 The Wall Street Journal homepage featured a 360-degree interactive ad unit sponsored by Ritz-Carlton Rewards Credit Card yesterday. The Wall Street Journal’s Custom Studios produced the campaign on OmniVirt’s VR and video ad platform. Once readers click on the ad, it takes them to a page dedicated to the campaign, where they can explore nine different neighborhoods in San Francisco, Miami and New Orleans. For example, if you click on San Francisco, you can whizz around Russian Hill at sunset. You can also click on “hotspots,” which zoom in on specific retail locations, like a wine shop and a grocery store, with suggestions on how to use the Ritz-Carlton Rewards Credit Card. The 360-degree videos are also optimized for mobile. A recent study conducted by Vibrant Media found 73% of more than 3,000 consumers surveyed from the U.S., U.K. and Germany said they were attracted to VR and AR ads related to travel and holiday destinations.